Over the early part of this year, I have been involved in a side-project created by Michael Stewart, writer and senior lecturer in Creative Writing at the University of Huddersfield. He devised four great walks around a series of stones carved with new poems about the Brontës and asked me to provide the maps and route descriptions. The Emily Brontë Walk is a suitably adventurous yomp across the wild moortops above Oxenhope and Haworth, but avoids many of the usual over-trodden paths. The Charlotte Brontë Walk is a lovely short loop through the countryside around Thornton, an area entirely new to me but very rewarding. The Anne Brontë Walk heads north from Haworth through Oakworth and Laycock, finding quiet paths and corners along Newsholme Dean and the Worth Valley. The Brontë Stones Walk is a linear route between Thornton and Haworth that provides a more pleasant alternative to the Brontë Way. These walks are now available, along with an earlier map I did of the Branwell Brontë Walk between Luddendenfoot and Haworth, as a series of leaflets available in Haworth and elsewhere (though not on this site). 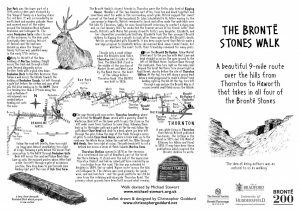 Michael describes the inspiration for this project; "I first conceived of the Brontë Stones project in October 2013 while taking a group of writers along another literary trail. I live in Thornton and have long wanted my village to receive recognition for its place in the Brontë story. All three literary sisters and their wayward brother were born here. I thought about the journey they took in 1820, over to Haworth. They were a happy family, but very shortly, after their move to Haworth, tragedy struck. First the death of Maria, the mother, then the two oldest siblings." "I was also aware that Anne Brontë was buried in Scarborough many miles away from the rest of her family and I wanted a stone to mark her return. Emily’s stone had to be somewhere suitably bleak, up on the moors. Charlotte would have had a living memory of her house in Thornton, and I wanted her stone to be part of the very fabric of the building. Then a fourth stone, somewhere obscure, perhaps marking Branwell’s act of painting himself out of the picture. And so I started to put the project together in my mind. There would be a linear walk, from the birthplace to Haworth. 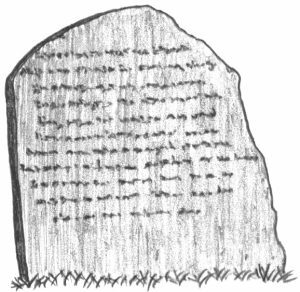 It would take in all four stones which would be carved with contemporary writing from some of the most prestigious writers around. Then there would be three linear walks to feature each of the sisters." For an early death, yours or mine. You got me all wrong, all the time. Write the last line. I am still at sea. I will right the wrong. I am still young. And the moor’s winds lift my light-dark hair. Still here when the moon drops down. I do not now stand alone.